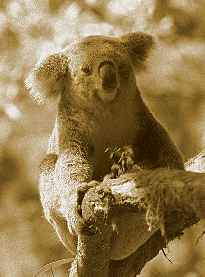 National Parks introduction and general information, for NSW national parks and wildlife service NPWS, Northern Rivers and Queensland parks and wildlife, QLD. Parks and wildlife codes, guidelines and rules. Gondwana Rainforests of Australia. "immerse yourself in nature and heritage"
A day visit to, or a camp out in a national park is a wonderful way to enjoy the natural beauty of our region. National parks* and reserves in northern New South Wales, the Gold Coast hinterland (Queensland) countryside and Scenic Rim backcountry region, are special places set aside to allow for experiences ranging from short walks through the rainforest - usually to a scenic lookout or natural attraction like a waterfall, through to multi day hiking trips through rugged back country, for self reliant bushwalkers, hikers and trampers seeking a wilderness experience. *Known as state parks to North American visitors. But regardless of how short or long a visit is, even with the utmost care, we do have an impact on the natural environment, and we need to ensure that it can recover. Become an "Ecotourist" and when you use a tour operator or guide service to visit national parks, check that they are National Parks licensed and they observe minimum Ecotourism Operators Code of Practice. In NSW there are over 820* protected areas. “Some of them can cope fairly easily with different types of human activities. Others are more fragile, and need a higher level of protection. This is one of the reasons why there are different categories of protected areas.” >> Ref..
National parks are areas protected for their unspoiled landscapes and native plants and animals. They are set aside for conservation and public enjoyment, and usually offer visitor facilities including walking tracks, day picnic areas, and camping grounds. See national parks in our region. Nature reserves: These are areas of special scientific and conservation interest, set up mainly to protect their native plant and animal communities. Nature reserves differ from national parks in that they do not have the provision of recreation as a management principle. As a result, few will have visitor facilities, other than walking tracks and signage. See nature reserves in our region. State Conservation Areas: (SCA) These are parks, often containing important natural environments, which have been set aside for conservation, public enjoyment and potential exploration. In our region these include Cape Byron SCA and Whian Whian SCA. Marine parks: These are unique and outstanding marine areas, set aside to conserve seawater plants and animals. They're divided into zones that allow different, sustainable levels of commercial and recreational activities. See Cape Byron Marine Park. Green List: The International Union for the Conservation of Nature Green List of Protected Areas is a global initiative to encourage, measure, celebrate and share the success of protected area excellence. Australia currently has three NSW National Parks and Wildlife Service reserves accepted to the Green List. 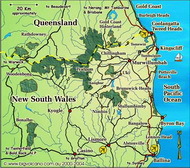 Arakwal National Park and Cape Byron State Conservation Area are local areas. Aquatic reserves: Aquatic reserves have been established to protect biodiversity and provide representative samples of our wonderfully varied marine life and habitats. Julian Rocks Aquatic Reserve, Cook Island Aquatic Reserve. NB: Editor note; the island/s within an aquatic reserve are almost always also listed as Nature Reserves. Visitation and activities are usually strictly limited. Historic sites: These are sites of national cultural importance. They include buildings, objects, monuments and landscapes. Historic sites are generally open to visitors. Tweed Heads Historic Site (Minjungbul). Marine protected areas are parts of the NSW marine estate managed to conserve marine biodiversity and support marine science, recreation and education. The NSW system of marine protected areas encompasses six multiple use marine parks (which cover an area of approximately 345,100 hectares), 12 aquatic reserves and 62 national parks and reserves with marine components. Ref. In Queensland, "Marine parks established over tidal lands and waters protect and conserve the values of the natural marine environment while allowing for its sustainable use. They protect habitats including mangrove wetlands, seagrass beds, mudflats, sandbanks, beaches, rocky outcrops and fringing reefs. Park boundaries can be established over tidal lands and waters up to the highest astronomical tide. The parks include the subsoil below and airspace above their boundaries, and the plants and animals within them." Ref. Most national parks have picnic facilities, with short walks through the rainforest or bush to scenic lookouts or natural attractions. Many also have camp grounds suitable for camper vans and walk-in bush camping, with full day and overnight walking tracks a featured attraction. Short walking tracks and circuits are generally simple gravel or hardened dirt paths. Some parks do have raised boardwalks or other construction suitable for mobility impaired visitors. Longer tracks are usually dirt trails, which maybe inaccessible during bushfire or "wet" seasons. Check conditions with the local parks office before embarking on your visit. Facilities provided by the National Parks and Wildlife Services will include picnic tables, fire-places, composting toilets* and shelter sheds. Fresh water is usually not available, so visitors should bring their own water. *Caravanners Note: Please DON'T empty your portaloo waste in composting toilets, as the chemicals in portaloos destroy natural processes that make composting toilets an effective eco-friendly option in parks and reserves. Many NSW parks and reserves have a vehicle entry fee for day visitors, and camping fees for overnight and extended camping, using a self registration station. Funds raised go back into park facilities maintenance, upgrades and conservation programmes. Queensland park camp sites can be booked online (preferred), or at local parks offices. Many national parks will also have private camping grounds or other accommodation located on private properties close to or bordering a park. Both NSW and QLD publish annual visitor guides with park descriptions and details of facilities and services, usually available at Visitor Information Centres through-out the region. NSW also offers annual park passes* for visitors who frequently enjoy our national parks. International visitors on a self drive touring road trip, who want to visit more than three or four parks, or to camp for more than 3 nights - especially in our region, may find this a more convenient and affordable option to paying as you go. *Annual passes exclude camping and other fees. National Parks are special places. Your co-operation is sought in the preservation of these areas. Parks are for quiet recreation. 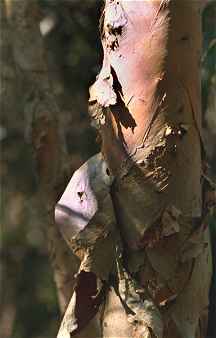 Enjoy the wildlife but do not disturb plants, animals, bushrock, Aboriginal sites or historic places. All are protected. Be careful with fire. Use only fireplaces provided. Use only firewood provided, bring your own, or better still use gas stoves. Chainsaws and firewood collection are not permitted. Drive carefully and keep to public roads. All vehicles must be registered and drivers licensed. Keep the park clean and safe for wildlife by taking your rubbish home. Observe all signs, as they are there for your safety and to help you enjoy your visit. Keep to walking tracks as they are designed to have minimal impact. Be considerate to other park users - keep your noise to a minimum. Do not feed the wildlife. They then demand it and can become dangerous. Look but don't touch! You might get hurt if you try to pat a wild animal, and some plants can sting you. Don't feed wildlife, and keep food secure from foraging animals. Human foods may harm native animals and feeding can make them aggressive. Heritage sites are fragile and irreplaceable. Take only photographs. Keep noise to a minimum. What seems quiet to you can disturb other visitors and wildlife. The unit of measure for the park sizes is the hectare (ha). One hundred hectares is one million square meters or one square kilometer. If you need to think in acres, one hectare is 2.46 acres and one acre is .405 of a hectare. We hope this is perfectly clear. Shall we talk a little about perches and roods? Parks & Wildlife Code excerpt from Visitor Guide Northern Rivers Region National Parks and Reserves brochure: NSW National Parks and Wildlife Service, Northern Rivers Region, date unknown.